Debt down, fan communications restored - where next for MUFC? Apologies for the lack of regular posts. Work and family have to take priority over football finance…. The beginning of a new phase? In some ways this week marks something of a watershed in the saga of the Glazer family’s ownership of Manchester United. In Moston, FC United of Manchester are beginning the building of their own ground, more than eight years after their formation in the wake of the Glazer takeover of MUFC (I heartily recommend Danny Taylor’s piece on FCUM published in today’s Observer). Two hundred miles south, the week saw the first formal meeting since 2005 between the management of Manchester United and the Manchester United Supporters Trust. The club’s meeting with MUST follows one with IMUSA and an interview by Edward Woodward with UWS. Woodward himself has apparently told the club’s Fans Forum that he would consider the introduction of safe standing. There are early signs the end of the Ferguson/Gill era may herald a new approach by the club to its core domestic support. The financial background to all this is radically different from 2005 too. In the year of the takeover, United generated revenue of £157m of which Matchday income was the largest element at 42% of the total. 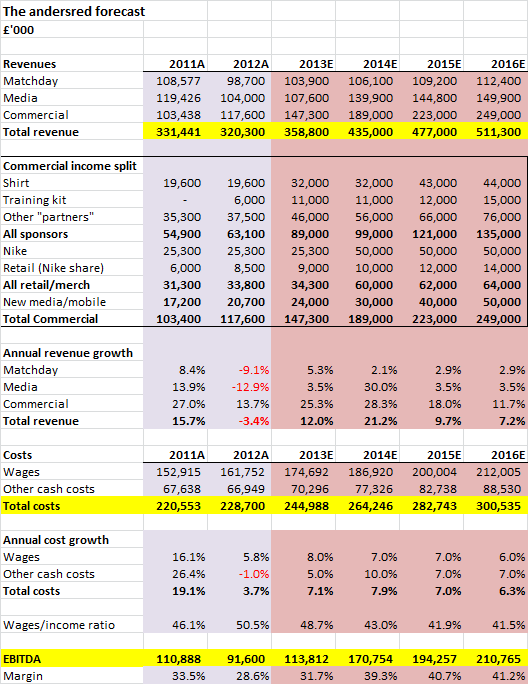 This year (2013/14), revenue will be around £425m and Matchday will be the smallest element at barely over 25%. Total gate receipts in 2012/13 were £54.2m, 15% of the club’s revenue. Although ticket prices have risen on average 55% since the takeover, the importance of normal season ticket holders and members has declined at the expense of the execs, corporate box holders and other hospitality clients. It is unlikely that ticket income from the c. 60,000 non-exec supporters contributes more than 10% of the club’s revenue these days. This dramatic reduction in the financial importance of normal match going fans should put to bed once and for all any ideas of boycotts or similar actions against the owners (the idea of which I have entertained in the past). The change in the club’s revenue should also be an opportunity. There is now absolutely no need for, and little financial merit in, the sort of price increases the club put through after the takeover. The expansion of executive facilities, the building of the quadrants and the price hikes added c. £40m per annum to United’s revenue between 2005 and 2009, around 25% of the 2005 total and roughly the annual interest bill in those years. Season ticket prices haven’t moved up for several years, and there is no need for them to do so. The daft ACS could also comfortably be abolished. The extra revenue from those who are forced against their will to buy certain cup tickets is absolutely irrelevant to the club’s finances. The Glazer family took a huge gamble when they conducted a leveraged buyout of MUFC. A quick look down the East Lancs Road shows how far a major club can be set back by excessive debt. Three years after the takeover, the financial crisis hit and the PIKs began to run out of control. Only the genius of Alex Ferguson and the sale of Ronaldo to Real Madrid allowed the whole rickety show to remain on the road. But now that phase is over. The club has over £83m of cash in the bank and net debt is down to £277m. That latter figure is roughly 2x EBITDA, down from almost 6x (including the PIKs) in 2010. The annual cost of the debt burden has fallen from £72m (including the PIKs) or £42m (excluding the PIKs) in 2010 to around £20m this year. The £600m of interest costs, fees etc will never be recovered but the risk of damage to the club a la Liverpool FC is effectively over. Because of the exploding value of TV rights, a smart commercial strategy and a once in a life time manager the gamble has paid off for the Glazers. The departure of Fergie and the reduction in debt means Edward Woodward faces a very different set of challenges and opportunities to those David Gill faced during most of the post 2005 period. The club can genuinely afford to compete with the likes of Barcelona, Bayern, PSG and City in the transfer market if it wishes, but showed little ability to make its financial muscle work for it in the summer window. For match going fans the signs of early promise must be followed up with concrete action. As the financial importance of the season ticket revenue falls, the importance of the Old Trafford “brand” increases. Whilst that has a tacky sound to it, it provides the opportunity for supporters to be aligned with the club. Proper singing sections of German style rail seats behind the Stretford End and Scoreboard goals, an end to the ACS, and at the very least a continued freeze in prices are all comfortably affordable by the club and would boost the atmosphere for the benefit of everyone. No subsidy by supporters is necessary for rail seating, it is a win-win. In the next two to three years, it is very likely the club will start paying dividends to shareholders again. There is an inevitability about this after the IPO in New York. However unwelcome for fans, dividend payments didn't hamper the club in the plc days and don't have to this time. Looking further into the future, the irony of a football club trying to build brand loyalty whilst at war with some of its most loyal fans is laughable. Supporter engagement through fan groups and yes, an element of ownership, helps bind fans to their club, even one the size of United. Perhaps David Gill had spent too long in the trenches of United fan politics to realise this. Over to Ed…. Last night United announced to the New York Stock Exchange that it was repaying around half of its outstanding bonds using a new bank loan from Bank of America. This will reduce the club's interest bill from around £31m per year (pro-forma post the IPO) to around £21m per year. 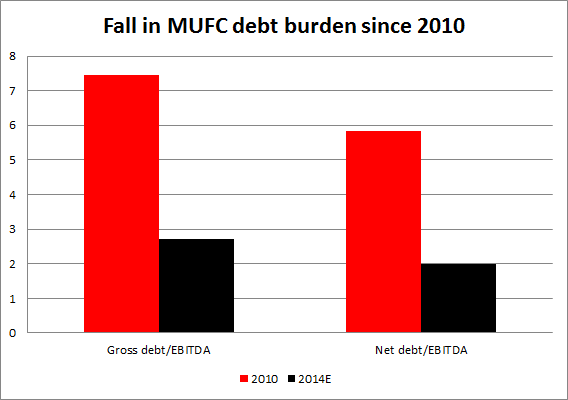 This blog sets out how United's debt has risen and fallen since the 2005 takeover and how much it now costs. For completeness, the table below shows flow of borrowings and repayments from the original takeover up to the most recent (March 2013) accounts. Initially the debt sat in either a subsidiary of Red Football Limited or Red Football Joint Venture Limited. Following the pre-IPO reorganisation, MU Finance Limited holds the debt for the new parent, Manchester United plc. The table above can be more easily summarised in this graph, which shows the total gross debt at each stage. The story is one of rising debt after the takeover as the preference shares accumulated rolled up interest. These were repaid in the 2006 refinancing, adding to the debt on the club itself and bringing in the famous PIKs. By June 2010 after the bond issue, total debt including the PIKs had spiralled to a terrifying £753m. The story thereafter is well known. The PIKs were mysteriously repaid (at a cost of £249m) in late 2010. The club spent around £90m (the Ronaldo cash) buying back the bonds it had just issued. Last year another £63m of bonds were repaid from the element of the IPO proceeds that the Glazers didn't keep. By the end of March this year, the debt (made up overwhelmingly of the remaining bonds plus a small MUTV loan and the mortgage on the freight terminal) was down to £367.6m. The figure oscillates with the movement between £ and $. As I have frequently pointed out, the interest bill from all this debt has totalled c. £350m since the takeover and the total cost (including fees, derivative losses and debt repayments) is almost £600m. 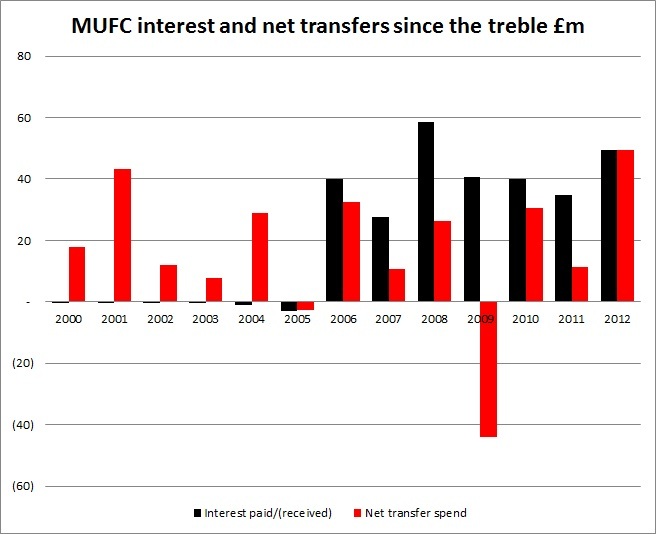 Paying interest has taken far more of the club's cash than has been spent on transfers. The annual interest cost is falling however, both in absolute terms and as a proportion of profits. From over 80% of EBITDA (cash profits) going on interest in 2006, next year the figure will be around 12%. I have predicted before that the club would refinance as quickly as possible (there are penalties on repaying bonds early but these expire over time). Over the next three to five years the club should generate enough cash to pay the remaining sum off. It is tax efficient to keep some debt, and future dividends may take priority over further repayment. The reduction in the amount and cost of United's debts is an unequivocal good thing. The question for supporters is who benefits? Will David Moyes be given significant funds? Will ticket prices continue to be frozen (or indeed will the club contemplate reversing some of the 50% plus hikes they implemented after the takeover)? Or will the extra cash from TV deals, commercial income and a lower interest bill flow out of the club in dividends. Most major football clubs reinvest the bulk of their money back into fans and football. In England at clubs like Arsenal, Liverpool and United, profit still remains the focus. On the weekend the German model is on display at Wembley, that's too often the English way of football. 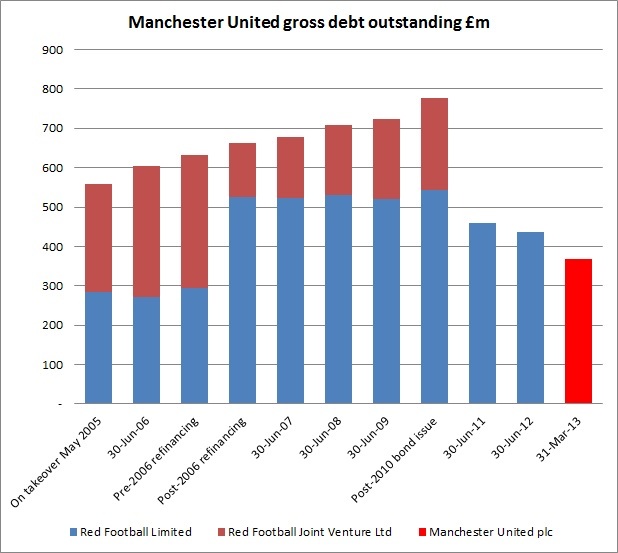 £500m of costs later, could we see a debt free Manchester United again? For almost eight years, Manchester United has been subject to a financial experiment to see whether a highly leveraged buyout could “work” on a football club. The only other experiment, at Liverpool, ended in a failure that continues to hurt that club to this day. At United, the Glazers’ purchase of the football club with borrowed money has been hugely costly both financially and emotionally, driving a schism between the club and its core support, sometimes even setting fans against each other. In the last six to twelve months, there have been major developments which mean that the eight year experiment is probably nearing its end. 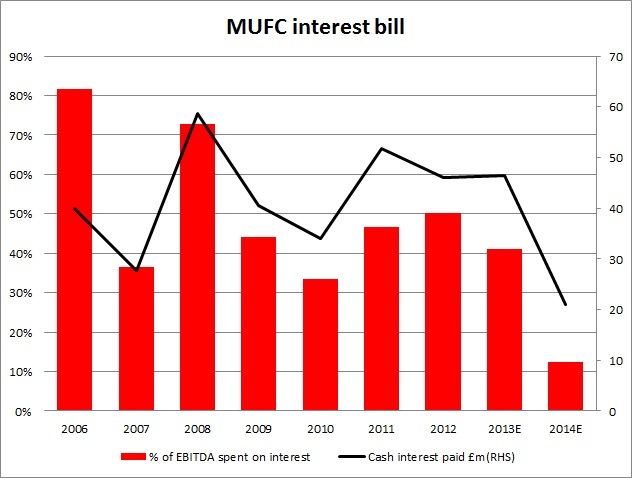 A combination of unexpectedly high growth in TV deals, new commercial revenues (especially new shirt and kit deals), the impact of new regulation on the behaviour of other clubs and the pay down of significant bond debt means we are entering a new phase in United’s finances where it very possible that debt is virtually eliminated in the next few years. Although undeniably a good thing, supporters should not become too excited about the prospects of a debt free Manchester United. The club has made it clear on its IPO roadshow that it doesn’t expect to spend more on transfers than it has historically. There is no sign whatsoever that the ticket price hikes that followed the Glazer takeover will be reversed. The club continues to refuse (against the advice of government and Parliament) to engage with supporters’ groups. The listing on the New York stock exchange means the owners will continue to prize profits over football. But financially, a big change is underway. This post explains that change. As this blog has described in detail over the last few years, huge debts were loaded onto Manchester United when the Glazers bought the club. By June 2010 these had escalated to over £784m. The infamous PIK loans were mysteriously repaid in late 2010. At roughly the same time the Glazers started using the cash earned from selling Ronaldo and signing the Aon shirt deal to repay a significant amount of the bonds that had been issued in February 2010. Finally, in August last year, half of the IPO proceeds were used for debt reduction (the other half going to the Glazer family of course). In total, the bond debt has fallen from £509m in June 2010 to £360m at 30th September 2012. There can be no doubt that United’s media and commercial income is going to rise very significantly in the next three to four years. Unusually in football finance, I believe the club will capture more of this extra income than usual, in other words profit margins will rise above their historic level. This will generate significant cash, allowing debt to be largely eliminated. Chevrolet. The new shirt deal adds £11.6m pa for the next two years (on top of what Aon pay) and then a further £11.9m pa (for a total of £43.5m pa) from the 2014/15 season. Premier League rights. We have already seen the value of domestic live PL rights rise 70% in the next three year cycle. Total domestic rights (including highlights, online etc) will probably increase around 60% and we are awaiting the outcome of the international sales processes. Taken together, a rise of at least 50% in PL TV income is virtually guaranteed in 2014. 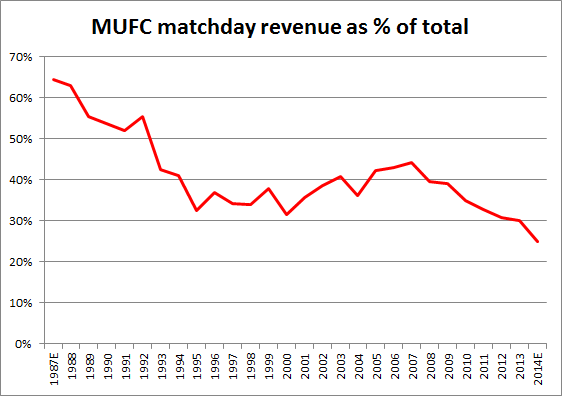 Assuming only low growth from the CL and owned rights (MUTV), that would still drive media revenue up 35%. Nike renewal. The long running Nike contract is beginning to pay out back ended profit share AND is up for renegotiation. Looking at other kit deals, an increase of £25m on the current £35-38m pa looks very achievable. Some analysts think the deal will double in value and they could easily be correct. These three areas alone will add almost £110m to revenue by 2015 (35% of the 2011/12 figure). To put that in context, that’s the equivalent of doubling matchday income. Whoever thought of it, the commercial strategy of targeting diverse product categories and geographies has been revolutionary. There remains considerable potential to add new “partnerships” in a number of industry “verticals”. The club have identified 40 industry sectors where it is believed it can sign a global partner, compared to 13 such contracts currently. Add regional partnerships and I see no reason why such sponsorship income should not double again over the next four years, adding another 12% to 2011/12 revenue. The same argument applies to the new media and mobile segment. Emerging market telecom companies appear to value the “content” link with United and there are plenty more territories to go for. My forecast is that revenue will increase by over £150m (c. 50%) over the next three years (assuming top 4 PL finishes and CL quarter finals each year), and that of this increase, over £110m (35% growth) is virtually certain, with and the balance is very likely to occur. If a huge increase in revenue can be forecast with some confidence, there remains more uncertainty over costs. 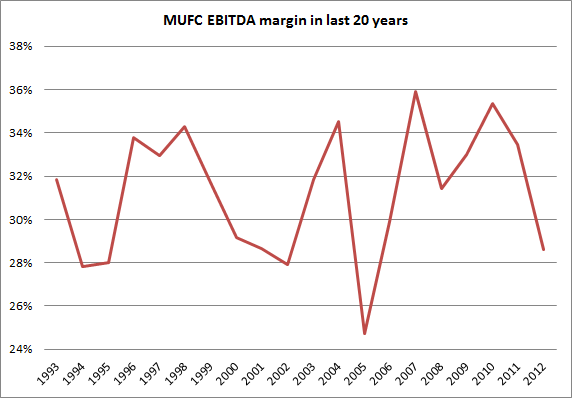 Since the beginning of the PL era, United have reported stable EBITDA* margins in a tight range, throughout the plc and Glazer eras. In other words, costs have tended to rise in line with revenues. I believe this pattern of stable margins will change in the future, and that margins will rise sharply above 40%. For this to occur, United’s wages to income ratio will have to fall. United will have to hold onto more of its revenue gains than has historically been the case. The suggestion that a company that has consistently earned margins within a tight range is about to make a step change in profitability should always be treated with great scepticism. This is true even if new revenue sources are supposedly “high margin” (as sponsorship deals are), as such margin can easily leak away to other stakeholders – in this case players and agents. On this occasion, however, I believe there are new factors that mean United will not have to pass on as much of every extra pound earned in income to the playing squad as it has in the past, in other words that margins can rise sharply. There are two primary reasons behind this, firstly that much of United’s revenue growth is unusual to the club and not something competitors can replicate, and secondly that Financial Fair Play will effectively work to slowdown wage growth, forcing other clubs to “bank” rather than “spend” their own incremental revenue. The first point is very straightforward, if United can grow its income faster than other clubs, it can hang on to more of it. There is an important distinction to be made between collective revenue increases (such as bigger TV deals) and “United only” revenue gains (such as the DHL training kit deal). It is the former that tend to “leak” into player wages because by definition all clubs (or in the case of the Champions League, all major competitors) receive the same income boost. The last PL international rights deal gave every clubs c. £7m extra pa and pretty much without fail they all went and spent it on transfers and salaries. By contrast, if United sign a unique £7m sponsorship deal, the club has far more chance of retaining the cash. Much of the club’s expected revenue growth is going to come from “uncommon” sources; the new Nike deal, the Chevvy deal, the mobile partnerships etc, etc. 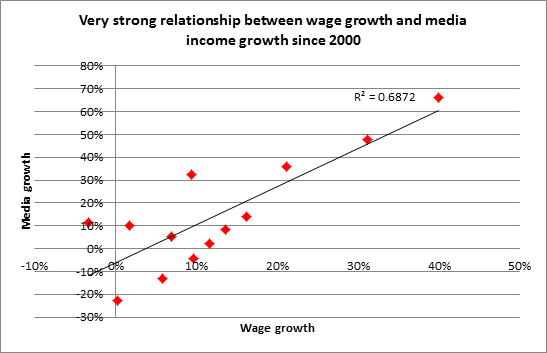 At United, the strength of the relationship between wages and (mainly collective) media income since 2000 can be seen in the chart below. The r-squared is 0.69. 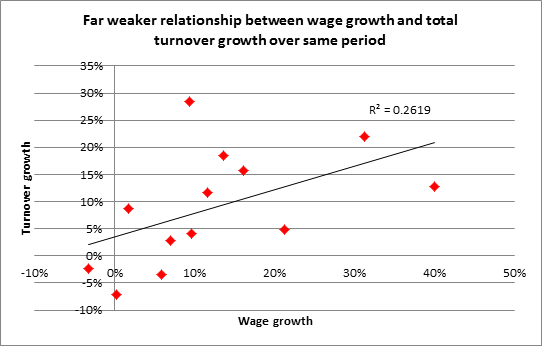 By contrast there is not a very strong relationship between total revenue growth, (which includes the expansion of Old Trafford, commercial growth, ticket price rises etc) and wage growth as can be seen below (the r-squared is only 0.26). Second and more importantly, both FFP and the new Premier League rules are coming and will inevitably change behaviour. The new regulations do not have to work perfectly to have an impact, rather they just have to alter the way other clubs operate. The main impact will be that clubs that risk breaching the rules will “bank” rather than spend additional revenues they earn. Thus the new PL deal will see a large number of clubs not thinking “let’s use this to boost the squad”, but rather “let’s hang on to this money to improve our UEFA breakeven result”. Both City and Chelsea need the £30-40m pa in extra PL revenue to have a hope of complying with FFP. If they spend the windfall, they will fail the test. The Premier League rules are specifically designed to dampen down wage inflation by limiting the amount of additional TV money that can be spent on player salaries. This is a totally new dynamic in English and European football where previously every extra penny earned (and more) was spent on players. In the longer term, both sets of regulation makes the next Oligarch/oil sheikh takeover less likely too. If a loss of only €45m is permitted each year, it becomes impossible to repeat a Chelsea/City/PSG and initially run up €150m+ losses. In the last fifteen years a new big spending club has come along every few years. This is likely to end and as in any other market, the lack of disruptive new competitors should boost margins. Despite the dampening effects of regulation, it would be naïve to believe that football wages will stop rising. 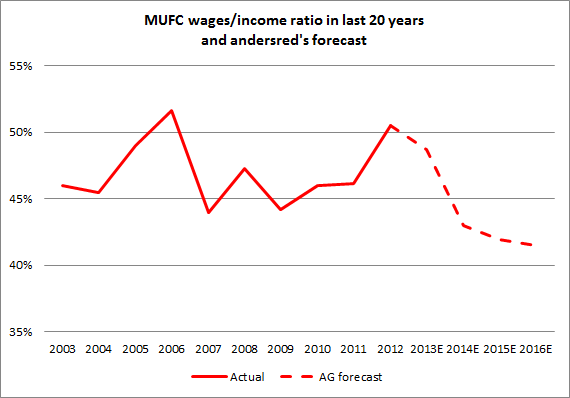 I would expect United’s wage bill to continue to grow substantially over the next few years (in my forecast I have assumed 24% up to 2015, only slightly slower than the 31% seen in the last three years). The key thing to note is that this wage growth is far slower than forecast revenue growth. With income rising c. 50% as described above and costs by only half this, EBITDA would rise 112%, taking margins from 29% last year to over 40% by 2014/15. EBITDA and margins are just a means to an end when looking at a company. Cash is king. For United, many of the main cash outflows below the EBITDA line are quite certain. Interest this year (post the IPO debt reduction) will be c. £33m. Tax paid will rise as tax losses are used up and profits rise, but in a predictable way. The big uncertainty is transfer spending, and I have assumed £40m net this year and £30m thereafter. 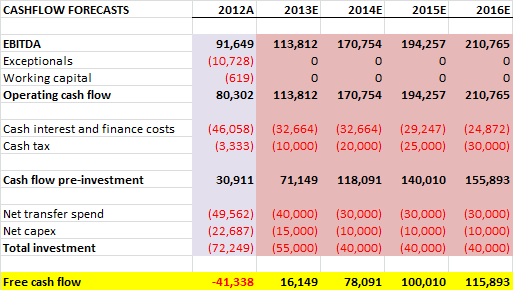 Add in £10m per annum of capex and the huge turnaround in “free” cash flow driven by the higher EBITDA becomes clear. On these forecasts, United will be generating £80-100m of free cash flow in two to three years, and thus there is the opportunity for substantial debt repayment and/or dividends. I have assumed a 50/50 debt pay down and dividend split from 2014 onwards. This leads to a sharp fall in the club’s net debt position. Net debt would fall from c. £344m at the end of the last financial year (pro-forma for the IPO) to under £200m in three years. If no dividends were paid, the figure would be near £100m. When measured against the size and profitability of the company, debt at this level is of no material consequence. The remaining bonds will be easy to refinance well before they are due to be repaid in 2017 at a significantly lower rate than the current 8.75%. Even if margins don’t expand from the historic range, United will generate very significant cash flow in the years to come. If we apply a flat margin of 33% (the average in the last five years) to consensus revenue forecasts, free cash flow in 2015 is still £67m, allowing £25-30m of annual dividends to paid and net debt to fall to 1.1x EBITDA by 2016. If United continue to qualify for the Champions League and make it out of the group stages, we can say with a high degree of confidence that revenue will rise by at least 35% over the next three years, and is likely to rise by 50% or more. 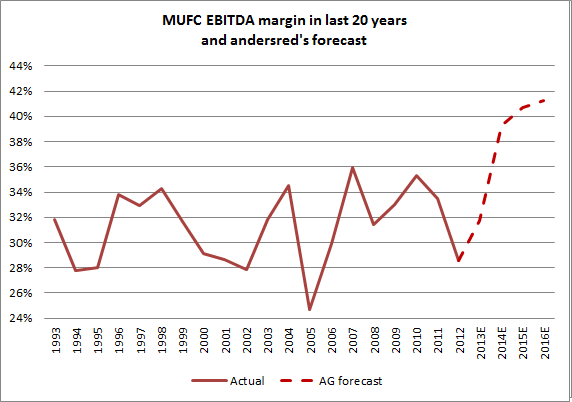 It is also likely in my view that EBITDA margins will break out from their historic range and could exceed 40%. If this occurs, United would generate £80-100m of surplus cash each year from 2014/15 and be able to pay material dividends (a yield of almost 2%) AND repay most of the club’s debts. Even if EBITDA margins are only maintained at the average level of the last five years (c.33%), free cash flow generation would still be around £50-70m per annum, allowing substantial debt pay downs. Many people, including me, have been highly sceptical of the United business model. It appears however that through a combination of luck (the TV boom) and judgement (the commercial strategy), the management have managed to deleverage the balance sheet and keep the club (reasonably) competitive on the pitch. With the net debt down to under £300m, FFP coming in and continued strong commercial growth, we are now facing a radically improving financial position. As the eight year LBO experiment comes to an end and the financial risk to United ebbs away, the club and its supporters surely need to re-connect. On issues like away allocations, ticket prices and engagement with supporters’ groups the club needs climb out of it bunker. For fans, the financial experiment is thankfully coming to an end, but much remains to be done; on supporter ownership and having a voice in our club and in making sure the cash flows into the football club itself and not the pockets of owners who still show no evidence of caring one jot for supporters.